Silverwell 1000 ppm Extra Strength Colloidal Silver Gel. The strongest Colloidal Silver Gel available in Australia! Large 250g (250ml) container ... $50 + $5 postage. Most colloidal silver gel offered on the net is probably only 20 or 30 ppm. Its barely stronger than the silver water you would make to drink. We believe that for external use you need something much stronger, but few people know how to make it or measure it. 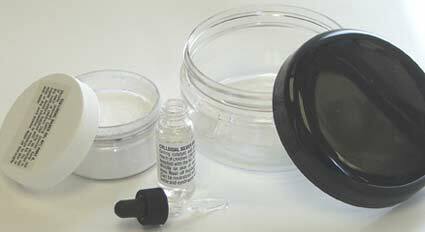 (You cannot use a meter to measure strong colloidal silver). The only way to accurately determine the silver content is by using Faradays Law of Electrolysis. Thats how WE do it. Our Colloidal Silver is 1000 ppm Guaranteed! Its a rich grey color, not clear as water like some gels. It's totally non-greasy, soothing, and absorbs and dries quickly. Available now in big 250 gram (250ml) pots. F = 96485 C mol-1 is the Faraday Constant. M is the molar mass of the substance in grams per mol. Click here to pay by Credit Card or to see our full range. Click here if you want to buy using Paypal on Ebay. (Its the only one of our products we sell on Ebay). Click here to see the full Silverwell site home page. "Wow amazing product. Forget the rest. " "Absolutely great product. Much more than I was expecting. Works"
"Thank you. Excelent product. I've had it 2 days and its working already"
" Miracle cream - worth every cent." "My father has a skin issue and so far this is the only product that helps him. I have just ordered another jar for him before he goes on holiday." "This stuff should be called miracle cream." "Absolutely works like magic! .. nothing works better or faster than your Silver gel." "Just to let you know the silver worked. I asked you to get it there quick and you did and I can't thank you enough for that". "Just a note to let you know the 1000ppm colloidal silver gel you sent me has done wonders in just a couple of days. I'm very pleased with it." "Congratulations on an INCREDIBLE PRODUCT. This silver gel cream is a godsend and I completely recommend this to anyone . Keep up the good work Silverwell and congrats on a truly great product. Many many thanks." "Great product, about time someone made it right. Thank you again." ". I used your gel for a few weeks, then stopped because I thought it wasn't doing anything. But then a month later I realised the backs of my hands are smooth again. I'm amazed".
" If Colloidal silver was a religion, I would organise the collection. Its early days yet but I will keep in touch with progress." " It's an amazing concoction". "Hi David, Can I order 3 more jars of the extra strength silver gel please, and have it sent to my address in Malaysia? My horse who has a huge tumour on his face, is improving so much since I started him on colloidal silver water and applying gel on the growth itself. His vet is completely baffled and is feeling so bad about telling me to put him down last month. Now, he's a believer too, and has asked me to give him some silver for himself!" If you would prefer to make your own gel just add these ingredients to your own home-made colloidal silver water. Makes up to 3 litres of colloidal silver gel. Its cool, soothing, non greasy, and more convenient than plain silver water in some circumstances. Copyright © 2016 Silver Well Aust. All rights reserved.